Nationally and internationally bestselling novelist with 14 books in print. 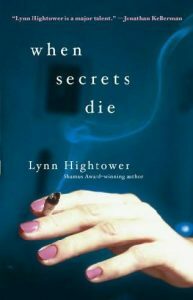 Ms. Hightower’s books have appeared on The New York Times “Notable” list, The London Times bestseller list, and have been selections of The Literary Guild and The Mystery Guild. She also is a recipient of the Shamus Award, and her latest book, Even in Darkness, was published by Severn House. Every writer follows an individual path. Our class is a way station on the journey where we can come together and work through the techniques of craft, the practicalities of thriving in the writing life, and methods for tapping into your creativity. Think of me as a writing coach—someone who can answer your questions, help you solve your writing problems, and show you how to hone and exercise your talent to get it in the best possible shape. We’ll be working on craft and creativity, with no fear of ridicule or aspirations to greatness—just some light so that you can find your way.